Peterborough United signed midfielder Simon Gillett on loan from Yeovil ahead of today’s (March 5) League One game against Wigan at the JB Stadium. And after the game Luton Town revealed that goalkeeper Mark Tyler is returning to Posh as a player-coach. Tyler is a Posh legend having made 486 appearances in a 14-year spell that ended in July 2009. Posh tried to bring Tyler (38) back to the ABAX Stadium during the January transfer window. Gillett (30) has played just six times for Yeovil this season because of injury, but they are all appearances made after January 30. Gillett has previously played for Bristol City, Nottingham Forest, Doncaster, Blackpool, Bournemouth and Walsall. He started his career at Southampton and has made close to 250 first-team career appearances, scoring 12 goals. Gillett will add some much-needed experience to a youthful side who have lost their last five League One matches. He starts today’s matchday squad. 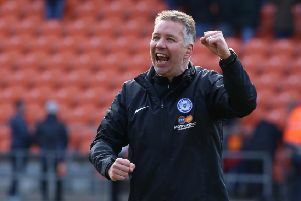 Posh manager Graham Westley said: “Gilly is a fantastic and experienced professional with a Championship level background. Exactly what we need to spread some learning and know-how into our young players. “He has qualities that we have been lacking and our youngsters will benefit immensly from his presence. Injecting a bit of fresh leadership is important at certain times and this is the ideal time for us.